The Ice Swimmer by Kjell Ola Dahl – Translated by Don Bartlett – Blog Tour Review. As soon as I started reading The Ice Swimmer I felt like was in the company of old friends.I had only met the characters once previously, in Faithless, but Lena, Gunnarstranda and Frølich are so easy to know and like. Probably because they are shown as normal people who have everyday issues. Lena is the lead character again on the two cases that are being investigated. She is a brilliant and dedicated officer but her personal life is a disaster and she now also has had devastating news about her health. Even though the team are close they don’t discuss personal issues and she is dealing with the situation on her own. Frølich has a smaller role in this novel but he is a character who nobody can control, no longer a member of the police but Lena and Gunnarstranda still include him when they feel he can help. It would be foolish to underestimate his worth. They are up against the worst type of people. Influential politicians who have enough power and wealth to halt any investigation into their lives and also the media. Who are capable of inventing a story and causing trouble if they want to. There is also unwelcome interference from other security forces which is upsetting for Lena. Norwegian crime series seem so different to other crime fiction. I’ve never read any other that has me googling food and I find it astonishing that a country can have extremely cold temperatures and still function. This series is now one of my favourite from Orenda and I’m looking forward to more. 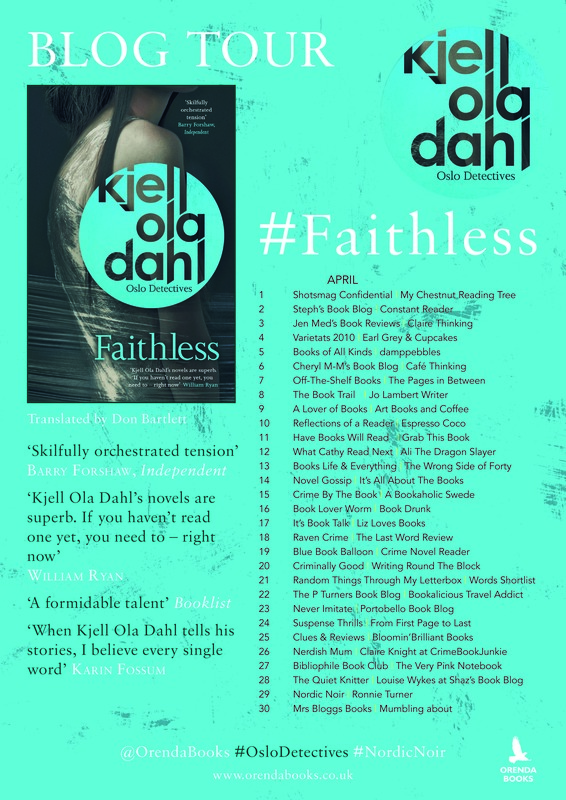 Faithless by Kjell Ola Dahl – Blog Tour Review. When the body of a woman turns up in a dumpster, scalded and wrapped in plastic, Inspector Frank Frølich is shocked to discover that he knows her… and their recent meetings may hold the clue to her murder. As he begins to look deeper into the tragic events surrounding her death, Frølich’s colleague Gunnarstranda finds another body, and things take a more sinister turn. With a cold case involving the murder of a young girl in northern Norway casting a shadow, and an unsettling number of coincidences clouding the plot, Frølich is forced to look into his own past to find the answers – and the killer – before he strikes again. Faithless is one of a series of books that features Frølich, Gunnarstranda, Lena and their superior officer Rindal. I haven’t read any of the previous novels and whilst there was backstory missing with regards to their personal lives it didn’t impact on my enjoyment of this novel. When a young woman is found dead after being charged with possession of cocaine Frølich feels he is in a dilemma. He was the officer who charged her and at a party the same night he discovered that she was in a relationship with an old school friend. He pleads conflict of interest but is ignored. This isn’t the only case being investigated. A young African woman has disappeared whilst on placement at the university. They have suspects but their hands are tied without any evidence. A few years ago, I had read no Norwegian fiction. Now I wonder why there hasn’t been more translated into English. The ones I have read lately all seem to be part of a hugely successful series that has been published for several years and it is all very enjoyable. Apart from Rindal, all the detectives feature strongly and despite not knowing anything about them I got to know them all quite well. The investigations are quite intense, the detectives are all intent on getting a result. I felt their every mood, their self-doubt, and their relationships with each other (Rindel seemed to be somebody to ridicule) and their feelings regarding the various suspects. Lena’s investigations were the most worrying and she was the character who I liked the most. She had faults but she was in no denial about what they were. The ending was intriguing. I know the book was originally published a few years before translation and I’m eager to find out how it continues. I hope I don’t have long to wait. With thanks to Karen Sullivan for the copy received and the chance to take part in the blog tour.